Indeed, Marvel's get together of amazing superheroes did incredibly well on screen most especially if watched at SM IMAX. I was asked how much will I rate for this worldwide most anticipated movie, The Avengers, with 5 as the highest and 1 as the lowest, I answered 6! Why not? Aside from the expected action filled scenes from land, water, air and even outside the earth, a Lough Out Loud moments that Robert Downey Jr. (Ironman) punched in most of his dialogues, a no "OA" drama of Scarlett Johansson (Black Widow) and Jeremy Renner (Hawkeye)in their acts and the adorable, everybody's wanted Chris Evans (Captain America) and Chris Hemsworth (Thor) must watched scenes and talks and lastly, the smashing Hulk (Mark Ruffalo)- these stuff will truly satisfy your movie cravings! Did I mention that the movie does not offer a lousy moments to viewers? 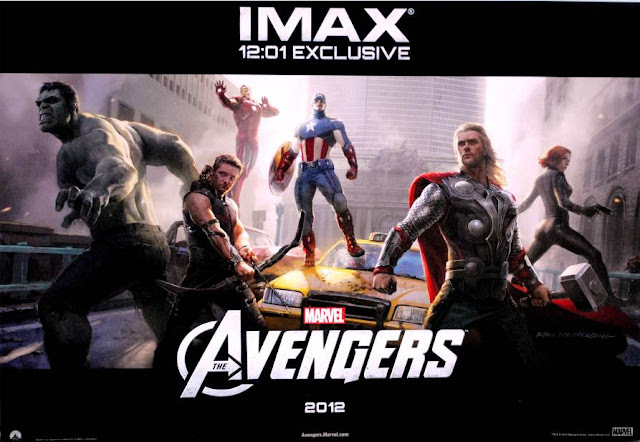 Gaining a "Stark-Tower" high rating from Rotten tomatoes's Tomatometer of 97% (as of this writing), The Avengers 2012 Assembly showcased more of a traditional Super heros behaviour and moves. Joss Whedon, the director, also gave highlights to some members of the Avengers who basically do not have a super power just like Black Widow who astonishingly jumped to one of the villain's flying transpo and fought fist to fist and then landed to the rooftop of "The Big Ugly Building in New York" (as what Captain America said in the movie) which is actually Ironman's Stark Tower. And do you think it's more on explosions from here, there and everywhere? Well, Whedon just did a very great job by balancing all the superheroes' abilities, flashing their fight scenes one by one but with an art. Honestly, after you watch the movie, you will recall every moves that each members did in the film. Of course, action movie will always contain a lacking ingredient. 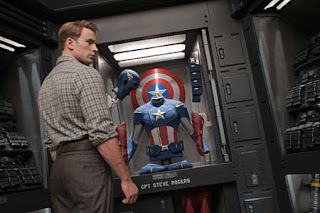 And for The Avengers, to understand and appreciate more on some scenes, you need to watch those previous Marvel's movies such us Ironman, Hulk, Thor and most especially on Captain America: First Avenger. 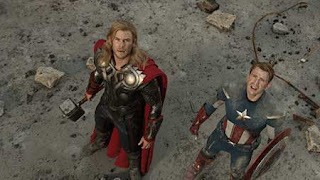 Why do you think Thor and Captain America are looking up in the sky? wooots! To give you a funny twist, here are the best dialogues i jot down while watching the film in SM City Cebu, IMAX Theatre. Ironman: I have plan, attack! Thor: Loki is beyond reason, but he's of Asgard and he's my brother. Natasha: He killed 80 people in 2 days. Just a little spoilers maybe but how about you? What could be your rating on this film? Is it worth watching at IMAX theatre? say some comments below and SMASH! the above dialogues suggest that the movie contains some humor, though not indirectly because obviously, its an action packed movie! maybe after two weeks, i will surely watch it!